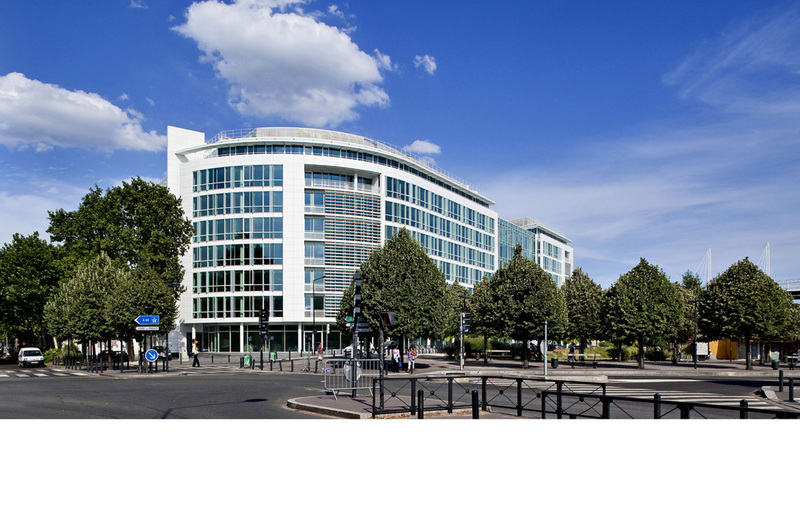 This pair of office buildings is located in Saint-Denis on the periphery of Paris, along one side of the Place des Droits de l’Homme - a public plaza that connects the railway station with the main avenue leading to the Stade de France. The project includes 32,300 m2 of office space and workshops, as well as two restaurants, and separate retail spaces. The two main buildings consist of seven floors above ground with two full basement parking levels. A six-story glass atrium joins the two buildings and provides an elegant covered entrance facing the plaza. The relationship of the buildings to the Place des Droits de l’Homme dictated their orientation. As viewed from the plaza, each building maintains its own identity while sharing a common architectural language. In this way the buildings appear as twins, joined by a transparent atrium, sharing similarities without being identical.